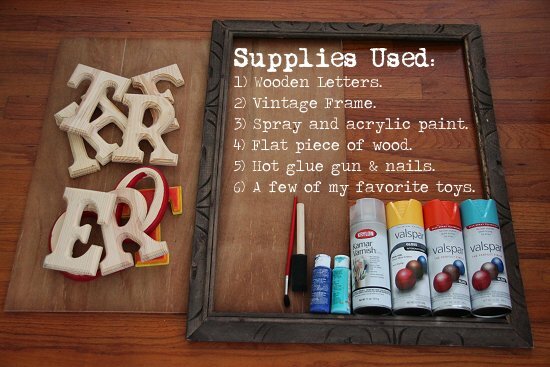 Thrifty Antique Store Sign DIY: No Hardware Store Trips Necessary! I've been curious about something for a while: will adding a vibrant sign help me increase sales at the antique store? 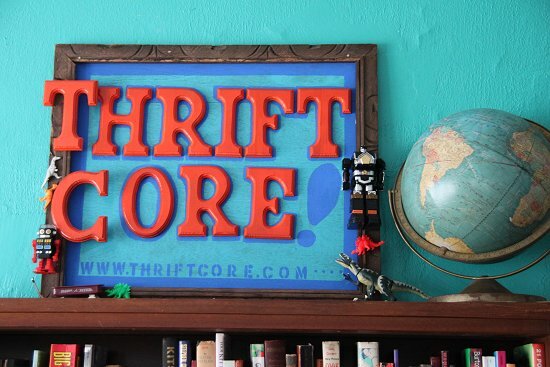 I can't wait to hang my newly constructed Thrift Core sign and find out! Don't think of this as a literal step-by-step DIY post. Instead, allow it to inspire you to use what you have on hand to create signs and props for your selling needs.Yep, I pulled all of these supplies out of my closet! 1) I spray painted the piece of wood and letters with my valspar gloss finish spray paint. It dried quick and bright, requiring only one coat. By the way, this sign is huge, at 27 inches wide and 23 inches tall. 2) I attached the vintage frame to the wood with nails. 3) Then I painted a one inch border and an exclamation point to add color contrast and depth. 4) I ended up having to saw off extra pieces of wood sticking out of the top and bottom of the frame. 5) Those wooden letters and toys are staying put thanks to my hot glue gun. This gives stronger hold than wood glue, but you won't be able to move your letters once you stick them down, so be careful! 6) Finishing touches were the painted border around each letter and the website URL at the bottom. 7) Bam, finished! 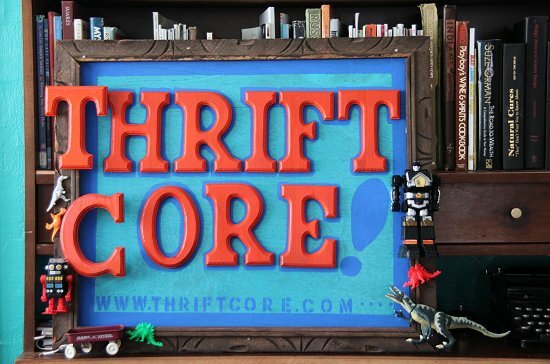 I'm glad I waited until inspiration struck to construct this sign, all the pieces fell together naturally and the end result defines the Thrift Core brand: colorful, animated, and playful. Completing this sign moves me one step closer to my Bigger, Badder Antique Store goals, too! This is inspiring and I'm going to have to root around and see what I have that can make a sign for my resale space. Wonder if people feel better when they see your space with a business name and website? Be interesting to see if it changes the business income. Thanks for sharing! Let me know if making a sign works for you! I love it! It turned out great! :) And you get to cross it off your goals list. Monica: Thank you! And yep, it'll be satisfying to cross it off the to-do list. That list is getting demolished this week! Rosaly: Thank you, means a lot coming with a team with your mad skillz. I hope it works! We must all be drinking the same kool-aid because I will be adding a sign soon to my resell booth as well. Except I can't refer to any outside website nor leave business cards in my booth so they'll just see the name of my booth. I'm wondering how it will effect sales as well. If anything the main reason I've been wanting to add a sign is that I've had several people ask me where my booth is at and hopefully this will help them find it easier. One more note, if I saw your booth and saw the sign, I would definitely go check out your website. If anything it should drive more traffic to your website. Jay: Oh, that's no fun that you can't refer to outside websites or leave business cards! That's another reason I'm making a sign- so people can easily find me in the shop. No missing this big bright sign! I'd love to see your sign when it's finished! Nice job! it's motivating me to finish my business cards - I'm going to stamp the Shop name and our booth # on the back of the cards - also need to make a banner for my blog sidebar..oh so much to do during my snow day today! Victoria: Yep, I'm in the same boat as you. So much to do. Good thing we love it! I'd love to see your hand-stamped business cards, by the way! I visited your booth today. Very cute sign. You are very creative. Love the sign! Excellent idea. I would definitely be more inclined to browse after spotting that sign. Jackie: Yay! :) Hopefully it will draw more people into my tiny section of the store. Thank you so much for has been sharing this information.